If you are looking for a great wine for Christmas turkey – or American Thanksgiving for my friends south of the 49th parallel – then Beaujolais Nouveau is your winner. And I have the winners from my Nouveau party this past weekend. Any of the French wines are good [I always drink a French wine first since they were the ones that came up with the marketing scam in the first place] – although George DuBeouf’s Gamay [LCBO 891846] is a bright young wine with a bit of effervescence and is under $10. That’s a good deal. I thought the best non-french nouveau was Chateau des Charmes Gamay [LCBO 318600] – in fact this is the one I am going back to the store to get again. It will appeal to both the locavore and the nouveau lover. Effervescent and full of bright sour cherries. The bottle will empty alarmingly quickly. Special mention to the tasting panel of critics that hung out around the open bottles of wine at my party. I know there was a big push for the Novello to be mentioned but it tasted too much like a real wine to me. I know you’ll forgive me because you all want to be invited back next year. Apparently rule number one of wine blogging is to not blog about Beaujolais Nouveau. 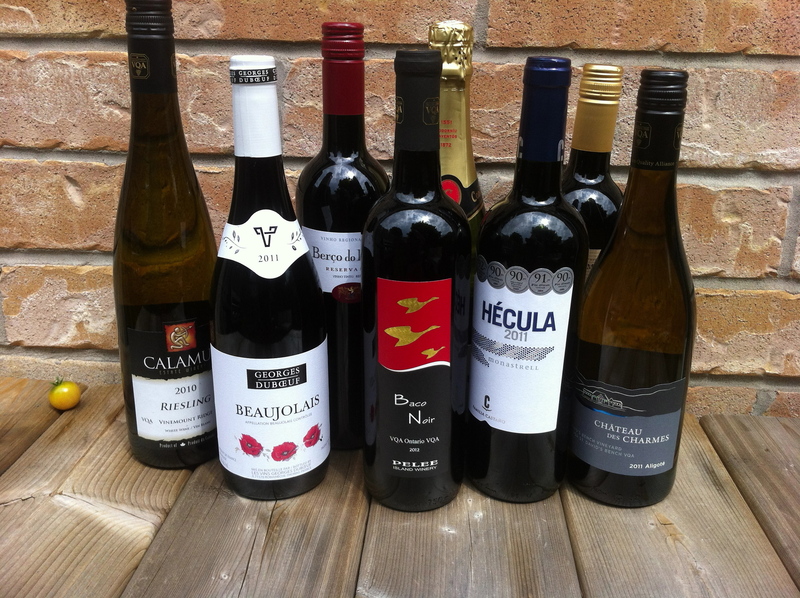 My whole wine blog – pullthecork- began with Beaujolais Nouveau four years ago! My best party of the year centres around Beaujolais Nouveau [with some friends and some food thrown in]. Wednesday night I may not sleep because of Thursday’s release of Nouveau [and the people at Chateau des Charmes just teased me today with a photo of their staff doing “quality control” with their Nouveau #jesuisarrive13 – not nice]! My last blog post was about Beaujolais Nouveau. Come to think of it, so is this one. … and I don’t even care. 300 blog posts and over 100,000 views later [oh, right, not supposed to talk about your own stats in a wine blog] I am still blogging about the blessed Nouveau. On Thursday I will be probably be making up a tune to sing the lyrics “Le Beaujolais nouveau est arrivé!” to – I really will. Oh, and mentioning statistics – I wrote Beaujolais Nouveau 10 times already. Take that wine critics. The Beaujolais Nouveau is on its way and I have a bit of a sneak preview. Well at least I’m training my palate for a preview. At the very least it’s the same grape as Nouveau. 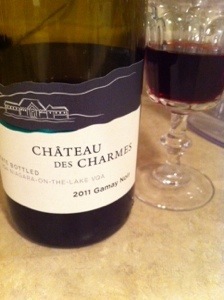 The fine folks at Chateau des Charmes in Niagara deliver this tasty Gamay 52 weeks a year. 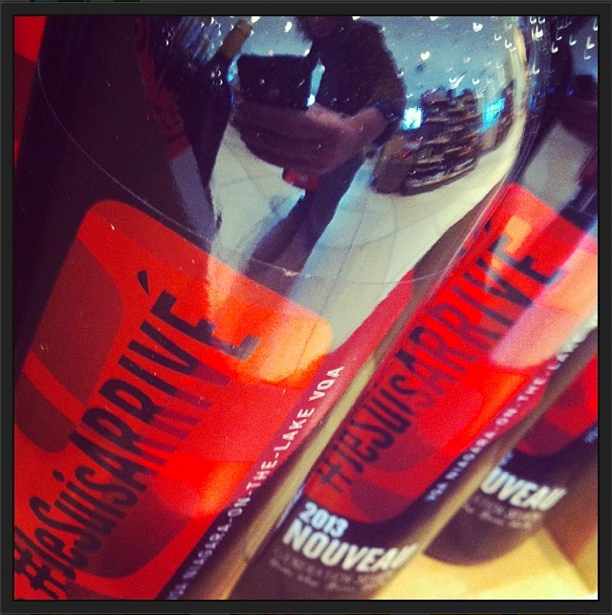 Coming soon to a store near you [if you love in Ontario] will be their “Nouveau” Gamay #jesuisarrivé13 – by far the cleverest marketing name for a wine I’ve ever seen. Thanks Bosc family – and thanks or not naming your nouveau after a cute small animal. My top shelf is empty. For those who follow this blog you will recall that the top shelf is the vin ordinaire – the wine that my wife can open without asking “is this saved for something special?”. So a restocking is in order. Here’s what I came up with – 8 bottles for $90. They are the wines that are good and inexpensive too. At my annual Beaujolais Nouveau party this year there was considerable discussion about which wine was the best. To be frank, there was more discussion about the wine than I was comfortable with. Nouveau isn’t meant to be discussed. Best local wine – Chateau des Charmes Seven Generation. Somebody commented that it tasted like the wine that their Dad used to make. We all concluded that was a good thing. I hope people keep buying it so that the Chateau makes it again next year. Best Italian – they both tasted the same to me but they were very good. To be honest they annoyed me because 1. They tasted too much like real wine and 2. Their labels weren’t festive or fun. Actually, the discussion of these two topics with Roger was the only “wine” conversation I was comfortable with all evening. I think the Italians deliberatly make good wine with serious labels just to bug the French. 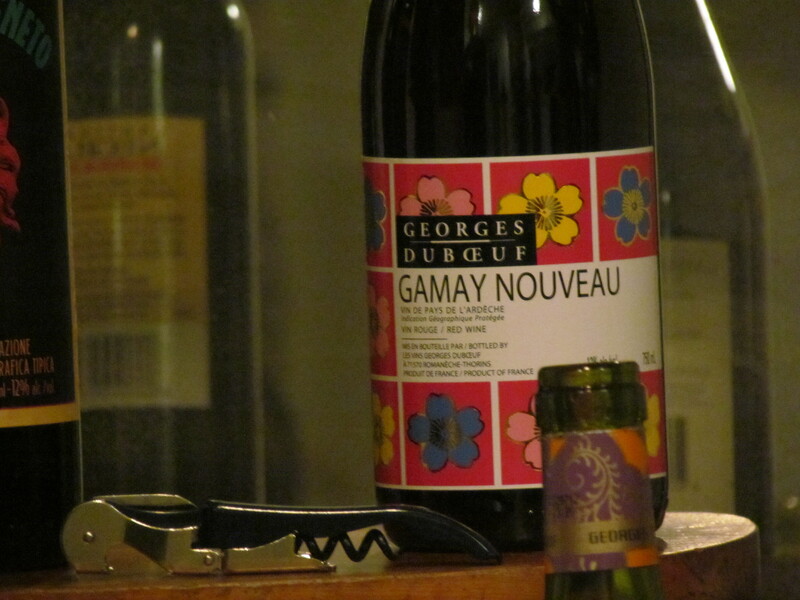 Best true Nouveau – Georges Dubœuf Gamay Nouveau – light, spritzy, festive label, inexpensive. This is what Nouveau is supposed to be – but I’ve already said too much.